I don't know anyone who "makes" books, but when I came across this book, I discovered that there are many people who do. The best thing about these books is that they're one-of-a-kind "editions". They're handmade and extremely personal creations. 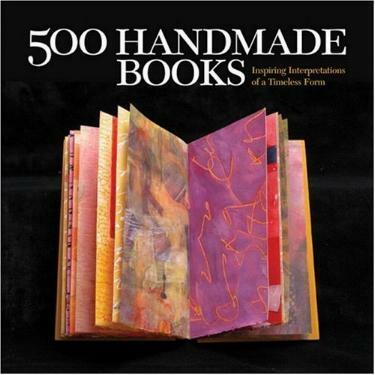 Paging through the first fifty or so pages, I realized this is a collection of examples of handmade books, and that there aren't any instructions on how to make your own. What is apparent to me from the examples, is that it's rather like a variation of scrapbooking, as many of the examples don't necessarily use "paper", but anything and everything that came to mind or hand. Some don't have writing or pictures, and instead, have photos or just plain or patterned paper. These books appear to be things like keepsakes, memories, tributes, collages, and just plain works of art. Some of the various materials used include things like hemp, twine, Thai paper, bark, canvas, polymer clay, Turkish paper, ribbon, Lokia, copper wire, rubber stamped items, thread, kangaroo skin, digital printing, stitchings, branches, beeswax, bamboo, photographs, steel, thumbtacks, mohair, Velcro, denim, silk dupioni, postcards, bronze, resin, graphite, human hairball (! ), beads, deer teeth, a computer circuit board, leather, photocopies, gelatin, seeds, buttons, lace, elephant hide (shame on you! ), elk bone, dominoes, tabbed recipe cards, and SO MUCH MORE. It would appear that you can use anything that's not liquid. Conclusion - A nice and "different" coffee table-style type of book.